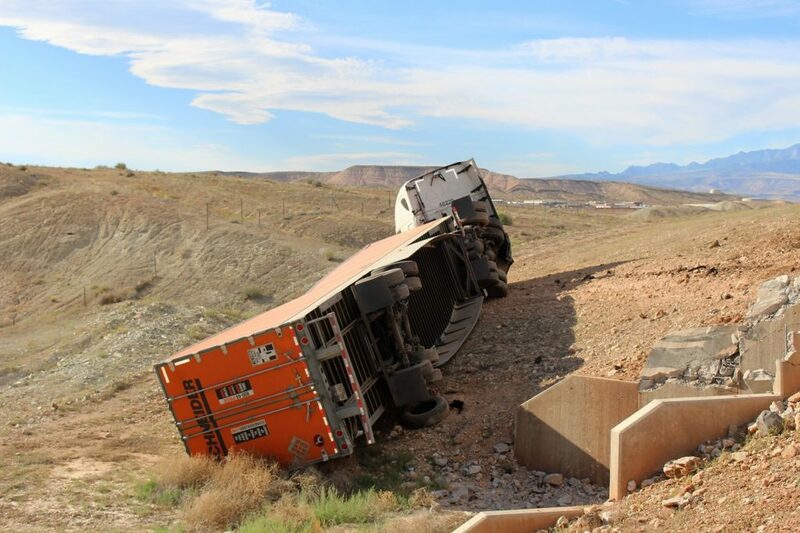 ST. GEORGE — A woman walked away uninjured Saturday after the semi-tractor trailer she was driving smashed through a concrete barrier and launched 20-feet down a ravine near River Road in St. George Saturday. 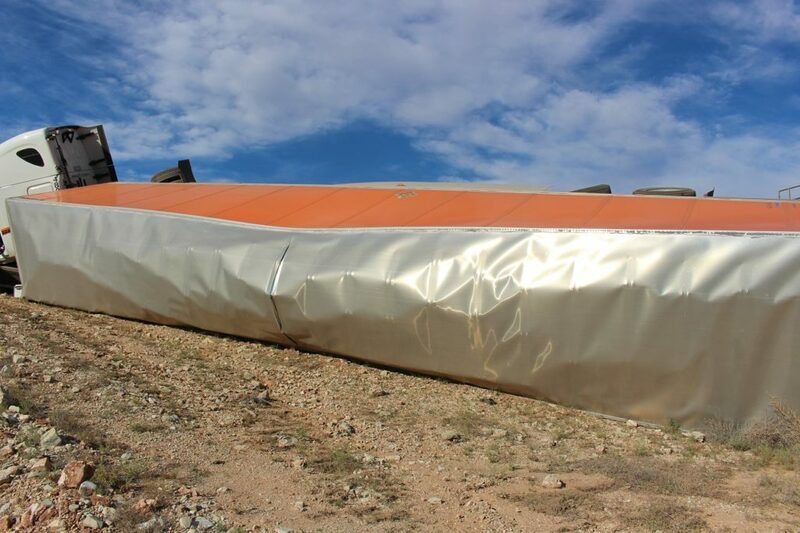 At approximately 5:11 p.m., officers and emergency personnel responded to a report of a rollover involving a semi-tractor trailer near 6364 S. River Road in St. George, approximately 3 miles from the Arizona Strip, St. George Police Officer David McDaniel said. 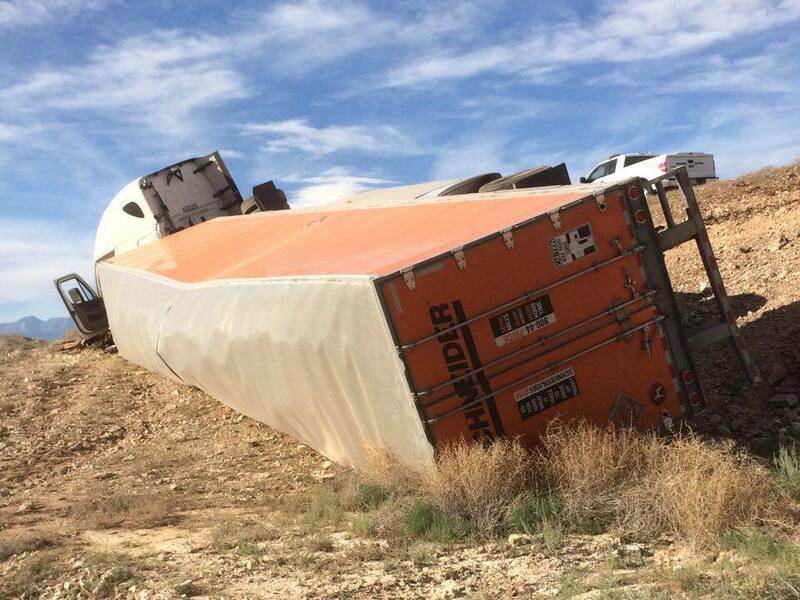 The woman driving the semi-tractor trailer was heading northbound on South River Road after leaving the Port of Entry at the Utah border. 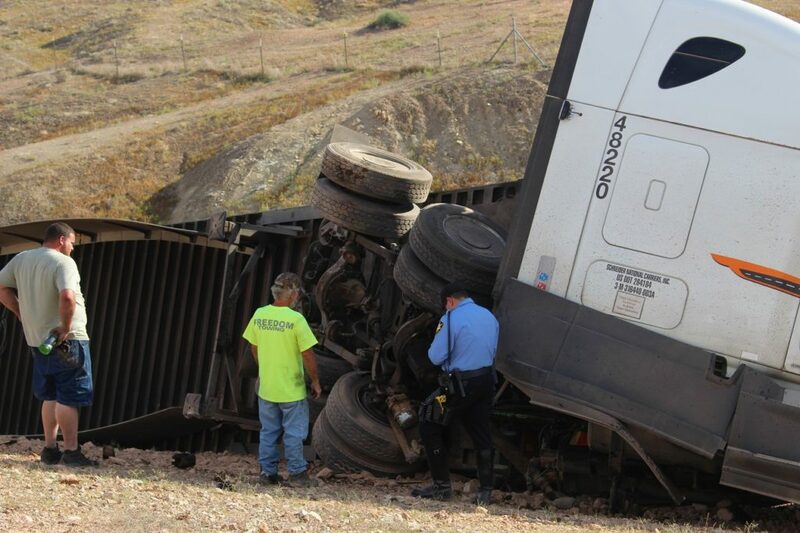 As the semi approached a small hill the driver tracked the curve a little wide, McDaniel said, and once it hit the gravel the truck smashed into a concrete barrier after the driver lost control. 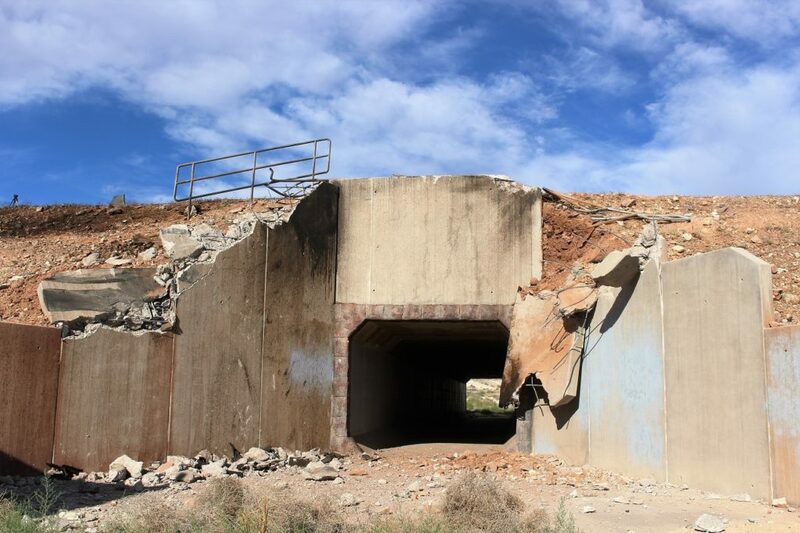 The cab hit the concrete barrier first, launching it into the air, while at the same time the trailer came smashing down on the concrete culvert, McDaniel said. 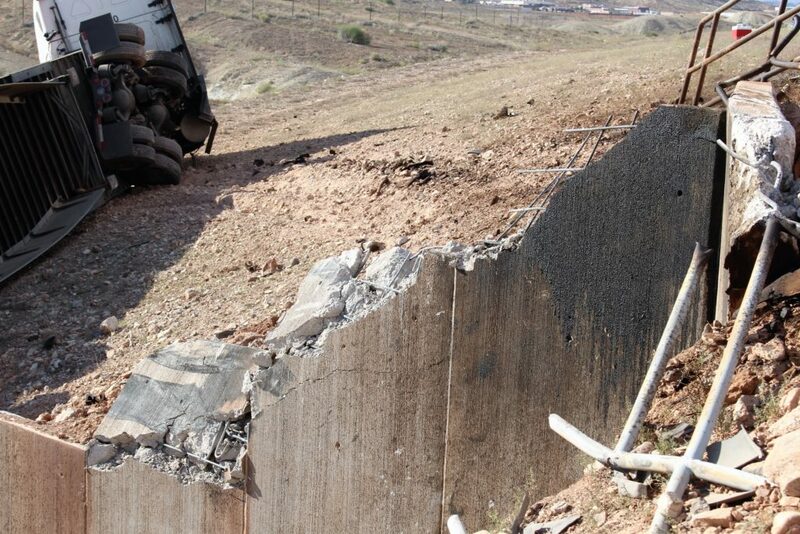 The impact bent the frame of the semi and sent the truck rolling over onto its side as it slid down the embankment. The driver was hauling a load of dry goods to Family Dollar Distribution Center, located at 4815 S. River Road, less than 1 mile away at the time of the crash. The woman was able to exit the semi on her own, McDaniel said, and reported to officers and emergency personnel that she was uninjured. 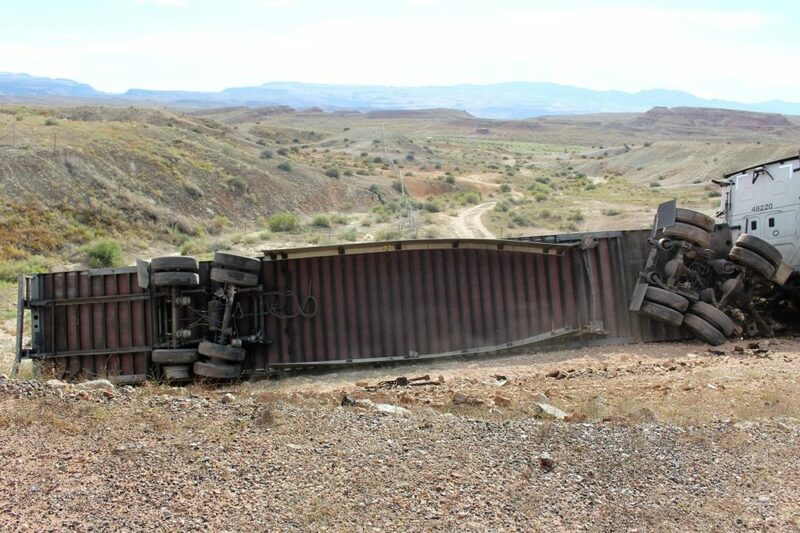 A Commercial Vehicle Safety Alliance inspector with Utah Highway Patrol was dispatched to the scene and conducted a roadside inspection of the truck and damages, McDaniel said. No citations were issued at the scene, as the crash is still under investigation, McDaniel said, and will be ongoing for the next few weeks. 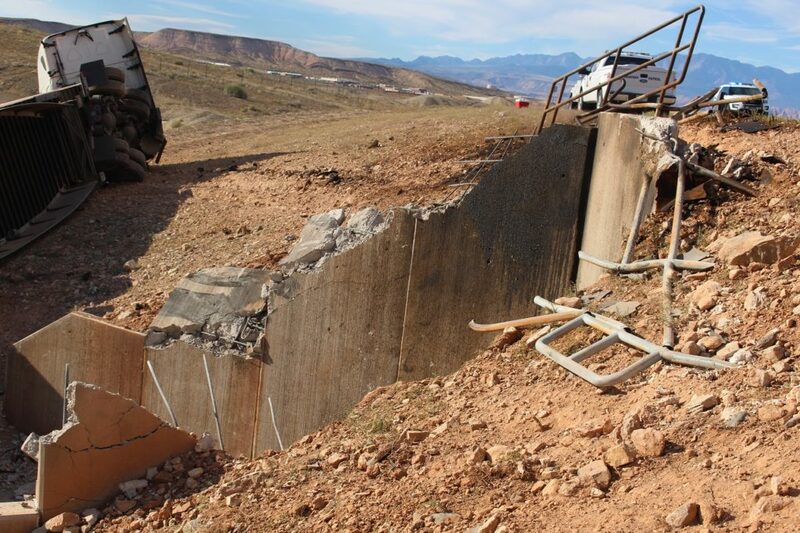 St. George Police Department, Utah Highway Patrol, Arizona Department of Transportation and the St. George Fire Department responded to the scene. Two tow trucks were also required to remove the truck from the ravine. Another driver going to be looking for a job. With her driving record, she may have to go to Mexico to find her next truck driving job. …. in another career. No trucking company would hire her after this serious an accident. I had a friend who did OTR trucking for about 5 years . They were sent on a lot of cross country runs . would have different issues than we have out west . 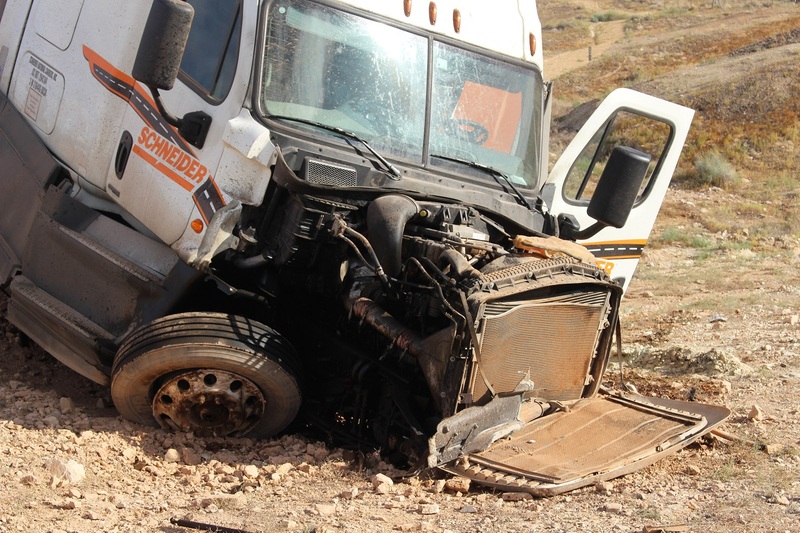 Trucking companies should have experienced trainers in the cab when they do their initial western runs .